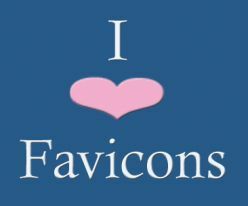 If you're wondering what a favicon is, you're not alone; the average person hasn't a clue as to what they are. And that's ok, cos they aren't really all that important -- they just make your website or blog look a good deal more professional than those without. As you can see from that image to the right, I happen to like favicons quite a bit. Seeings how easy they are to create, I'm not sure why everyone doesn't have one. So, today, I'm going to tell you how to get one of your very own. Look up at the web address tool bar thingie (hey, I never said I was an internet expert). See the web address? Good. See that red, green and blue symbol to the left? That's a favicon. It mostly just looks good. I don't think it serves any other purpose, really. Where else can you see it? If hosted correctly, the favicon will show up in the web address bar, the left corner of your browser tab, and also your bookmarks list. Ok, I want one. How do I make it? First, choose the image you want to use. 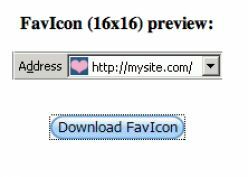 Keep in mind, the favicon will only be 16x16 pixels when finished -- that's pretty freaking tiny. I don't recommend you use a photo or summat, unless you have incredible re-sizing skills, cos it will not render well in the web address bar thingie. Second, use a free favicon generator (I use http://tools.dynamicdrive.com/favicon/) and upload your image. Click "Create Icon". It will then create a 16x16 pixel image and it will even give you a preview of how it will look in that address bar thingie. Third, once you're happy with the results, save it to your computer by choosing the "Download Favicon" button. It will save the image as an .ico file on your computer. Don't worry, you don't need to understand what that means -- not really. Fourth, open your .ico file in a photo editing application and re-save it as a .png file. If you're on a Mac you can open it in Preview and simply change the file extension to .png. It's really that easy. I'm going to tell you how to do this on blogger beta, because that's what I use. You might have to change it up a bit if you use another blogging platform. 1. Upload your .png file to an image hosting service. I use Photobucket.com and they are pretty nifty -- and free. 2. Copy the link of the newly uploaded image. which will probably be very close. 5. CHANGE THE IMAGE LINK from my image, to yours. I have only included mine to make it easy for you to see where it goes. Just paste your link over top of mine and there you have it. Look at the image below, and that's how it ought to look in your template, but with the red part being YOUR image link, as opposed to mine. It sounds a lot more complex than it is, really. After you've done it once or twice, you'll realize how easy it is. Have fun with it!